This 500 Watts solar panel system is designed to provide you with the main components you can get from any decent solar package. Buy the 500W solar panel kit to provide your home or office with the energy it needs to enjoy uninterrupted power supply for your basic home appliances! From the highly-efficient premium 500W solar panels, to efficient inverters and durable batteries, the 500 watt solar kit is a high quality, safe components for your off grid installation. The 500 W Solar panel system is an improvement on the 400 Watt Solar Panel Kit and is ideal for a mid sized family home or a two room office. It will power all basic home and office appliances all day long except Air Conditioning units, washing machine, electric Iron, and Electrical cooker. Our 500W solar packages include the basics that you'll need for your solar installation. 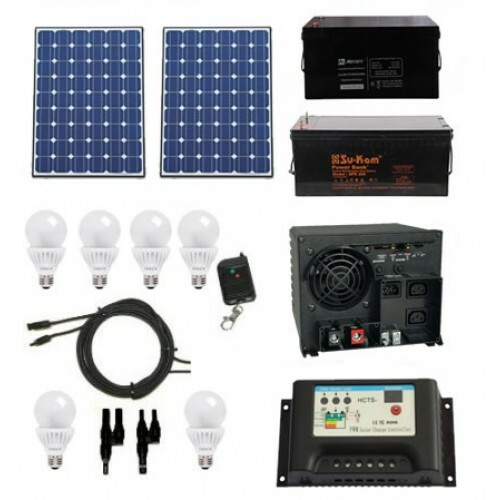 The 500 watt solar system includes the 500 W panel, a 200Ah batteries, a 30Amp charge controller and a 1KVA Inverter, we've listed a few more items that you may want to include with your package order. If you are interested in this package call +2348029541018 to order now. Assuming the simulated household presently spends an average of N20, 000 per month on diesel or Petrol generator and N5, 000 per Month on PHCN electricity, it means N240, 000 is spent in a year on fuel and N60, 000 is spent on epileptic power supply. If this household has decided to finance this investment with a bank loan at 20% interest rate per year and a monthly service fee of the N23,000 that is presently spent on Diesel or Petrol Generator. It will take 2 years and 3 months to finance the solar package investment. The inverter package investment will also take approximately 2 years because the household will still need to run their generator on several occasion to charge the inverter. So we will assume that N10, 000 will be spent on servicing the inverter loan and another N10, 000 will be spent on fueling the generator. So from the investment analysis, it means a household that install a solar panel, will enjoy free electricity from the solar panel for extra 18 years. Enjoy free Electricity from the Inverter for extra 8 years and enjoy 3 years free electricity from batteries. In the table below you find a list of all the appliances you can power with the package. The 300W poly solar panel is all you need to provide your home with reliable and affordabl..
200 Watt Solar Panel Kit is ideal for customers who want to enjoy more than the 130 Watt S.. This 1000 Watts solar panel system is designed to provide you with the main components you can get f.. This 300 Watts solar system is designed to provide you with the basic home solar system you can get .. The 80 Watt Solar Panel Kit from Solaroid Energy is ideal for customers who want to e.. The 600 Watts solar panel system is designed to provide you with the main components you can get fro.. This 2KW solar panel system is designed to provide you with the main components you can get from any..